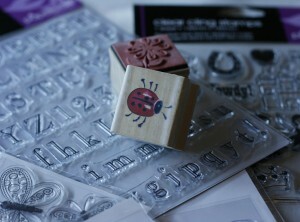 Clear and timber mounted rubber stamps. I bought these stamps after hunting literally everywhere, I came across a great range of rubber stamps in the paper craft and card making section in Spotlight. They are clear too which makes lining them up even easier. As an alternative to a $20 textured rolling pin or a $30 mat, These stamps cost between $2 and $7 – Bargain! I bought a range of fonts, texts and images for both boys and girls. They can be used individually or in various combinations to achieve both small toppers for cupcakes or larger coloured (stamped) images and imprints on fondant covered cakes. Here’s a few ideas….. Always ensure the stamps are new, clean and are only used with your fondant – don’t let your three year old make grandma’s birthday card with them! Imprint directly into the fondant and trim or cut out with a shaped cookie cutter for a cupcake topper. 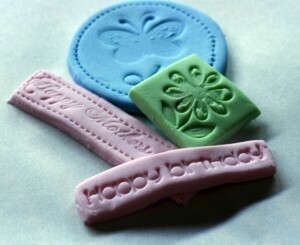 Imprint into the fondant after covering a cakeboard to write a message, add patterns or text. They can then be dusted with lustres and edible glitters or outlined with edible pens. 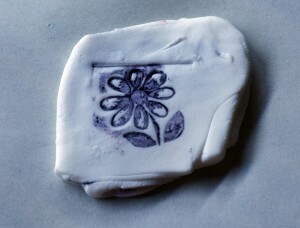 Use food colours as you would an ink pad to stamp the fondant. You could try moistening a sponge, sqeezing out the excess water and spreading gel colour over the top. Press each stamp onto the sponge and trasfer onto the fondant (or even hard, well set royal icing on cookies?) If you repeat the stamp in a number of colours, slightly moving it over each time and creating a blur effect, you can even come up with funky teenage designs. Stamps may need to be dusted with cornflour or icing sugar so they don’t stick to the fondant when imprinting. You are only limited by your imagination…go crazy with experimenting and create some amazing cakes!